Sri City, February 25, 2017: The 46th National Safety Week celebrations were inaugurated by Mr. Damodaram, Motor Vehicle Inspector, Puttur in a function held here on Saturday. After addressing the employees he administered safety pledge. improving process safety and achieving zero accident rate. 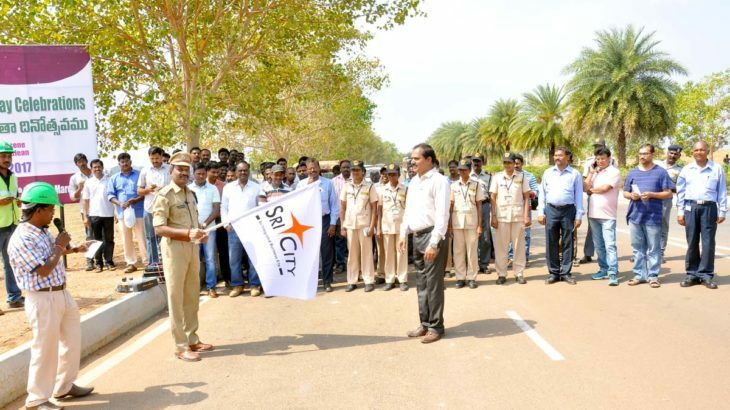 He called upon the Sri City community to actively take part in the programmes being arranged through out the week. “Mr. Altaf, General Manager, Security & Vigilance informed that as part of the safety week celebrations, several awareness programmes and quiz, essay writing and drawing competitions will be held for employees and students throughout the week. On 4th March, which is being observed as the National Safety Day in our country, a concluding function will be held. Mr. K. Narendra Babu, Assistant Manager, EHS (Safety) coordinated the conduct of event.